Bikers of all types will be happy in Park City, with a large selection of singletrack trails, paved city paths for family outings, and plenty of long mountain roads for skinny wheels. Popular cycling journal, geared towards mountain west cyclists. A traditional, custom bike shop, specializing in complete high-quality bikes as well as accessories and parts. Always geared toward the customer, Park City's Mountain Velo offers bike fitting, sales, enhancements and support for the discerning rider. At Deer Valley Resort in Park City, Utah, Stein Eriksen offers winter and summer gear for sale or rent. Perfect for beginners, the Rail Trail extends 28 miles through the valley. Part of the Great Western Trail, the 20-mile Wasatch Crest Trail is one of the best in the area. Designated downhill trails let riders take off at full speed. Road bikers have plenty of options, using the Rail Trail to access the higher mountain roads. 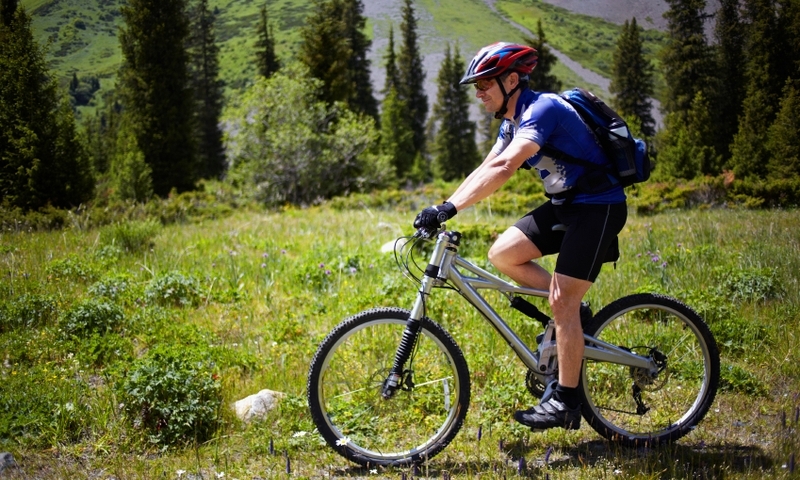 Park City mountain biking can be a grueling, sweat-dripping adventure or an afternoon of tootling through historic sites and beautiful scenery. There are options for groups with small children who struggle to stay balanced, and trails to challenge the most experienced rider. With over 355 miles of single- and double-track mountain biking trails, and many more miles of open road through the countryside, the area offers limitless fun for cyclists. Mountain biking is one of the most popular summer sports in the area, so there are plenty of options. Here are a few suggestions, but be sure to ask around at the bike shops to get latest news on what's riding well and what's not. Following old railroad lines, this 28-mile graded path is an easy trail through the Wasatch Mountains, heading down to the Silver Creek Canyon wetlands, and ends at Echo Reservoir. The trail has multiple access points, making it a great way to explore the area. The Park City trailhead is on Bonanza Dr., south of Kearns Blvd. This beginner singletrack is perfect for people coming from low altitude, as it sits right below Park City. The trail is 14 miles long, but there is only 600 feet of vertical gain along the well-maintained path. The trailhead is the same as the Rail Trail on Bonanza Dr., south of Kearns Blvd. in Park City. One of the best Park City bike trails, this follows the crest separating Big Cottonwood Canyon and Mill Creek Canyon. While the most common route is 20 miles long, there are plenty of variations, so pick the duration and difficulty you want. The most common and convenient trailhead is Guardsman Pass, located right before Brighton. Starting at the Park City Mountain Resort Parking Lot, this strenuous trail winds 20 miles with a total vertical gain of 3,472 feet. The ride features a long loop with challenging technical terrain and rewarding views to help push away fatigue. There a huge excitement and thrill from barreling downhill at top speed while barely maintaining control. There are downhill-only trails in 6 miles loops with jumps, ramps and stunts to make things even more interesting. The trails starts from Kimball Junction at I-80 exit for Park City. The surrounding roads can get riders right into the heart of the mountains, so try out Weber Canyon Road, a 30-mile out and back passing through Oakley, or the Peoa-Francis Loop, running 45 miles through the two towns, including a spur out to Woodland. Both start on the Rail Trail in Park City. Whether you're just looking for a scenic stroll along some of the trails in the area, or trying to demo the latest full suspension model, Park City guides will organize tours, rent gear and give plenty of helpful advice, so find the company below that fits your group's needs. Find a great online trail resource at UtahMountainBiking.com. Moab Utah is famous among mountain bikers for it's many slickrock biking trails.